Potter Creek Crusader teams examined areas inand around the creek near Berkeley Township Elementary School learning how to search for environmental contaminates. Teams were instructed by Greg DePaul, emergency response specialist with the NJ State Police Hazardous MaterialsResponse Unit. The students used field testing equipment to collect bothwater and soil samples. They recorded the information gathered and createdtheir own scenarios with the collected “evidence.” For more information aboutthe Potter Creek Crusaders and their new book “Beyond the Shadow,” please search www.pottercreekcrusaders.org . OCEAN COUNTY - The Barnegat Bay National Estuary Program helped BTES fund a program that would enhance their students' existing natural resource programs, such as Trout in the Classroom and the Rain Garden Project. The district has been a leader in the field of environmental studies for over 40 years. As Potter Creek Crusaders, a group of sixth grade students were able to expand their experiences by exploring the Potter Creek Watershed. They identified and compiled an inventory of the vegetation and wildlife indigenous to the area. They also learned about the Public Land Act, the significance of the area's rescue from development and the important connection between Potter Creek and the Barnegat Bay National Estuary. BTES staff and several retired educators provided the basic instruction. They were assisted by educators from the Ocean County Soil Conservation District, the Ocean County Parks System, the NJ Forest Resource Education Center, Sedge Island Natural Resource Education Center, the Marine Advanced Technology Education Center and the Berkeley Historical Society. The Potter Creek Crusaders used digital photography to capture what they saw and learned about at the creek. They were able to use these photos to teach others the area's importance. This was done by publishing a book entitled, "Lens on Potter Creek," creating and distributing the brochures, presenting assemblies to their fellow students and by creating an impressive photo display. The presentation was also given at the 12th Annual Barnegat Bay Roundtable on April 29. The photo display can be seen at the Berkeley branch of the Ocean County Library System. It will be housed there for the entire month of May. 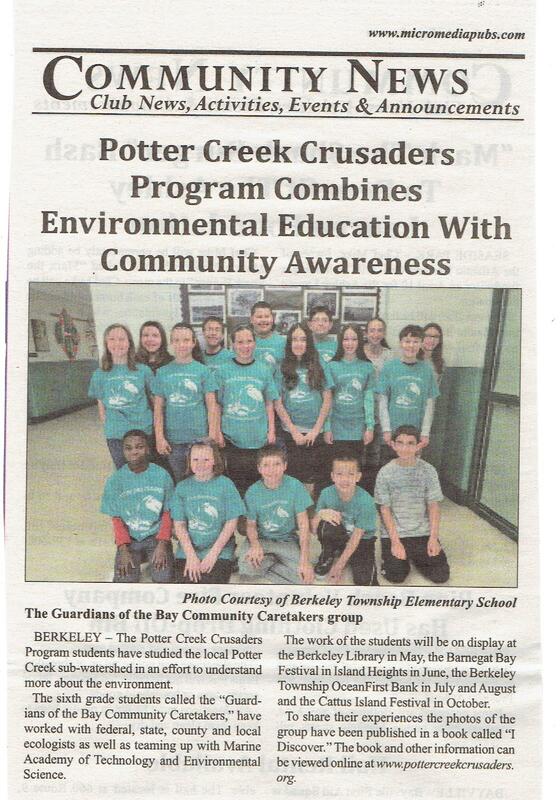 The group's goal was to help educate others about Potter Creek and the Barnegat Bay Estuary. The group achieved their goal in many ways and in the process the students have become a small young band of enthusiastic environmental advocates. ...A highlight of the event, was the participation of students from Berkeley Township Elementary School , who recently received a grant to enhance their environment and conservation library resources and to become more connected with the outdoors by visiting local parks and conducting research.